Today we used trigonometry to measure a flag pole without actually measuring it. We used a clinometer to find the angle from my eyes to the top of the flag pole. We used a meter stick to find the length between the group and my eyes. We used a surveyor’s wheel the measure the distance I would be standing from the flag pole. Dawson measured that I was standing 5.95m from the flag pole. The distance between my eyes and the group is 1.47m. The angle that we first got using the clinometer we got 45 degrees, but Dawson realized that it wasn’t a true measurement because the weight that was used to hold the string straight was hitting my hoodie strings so we needed to re-measure. This time we got 55 degrees. When we compared with Annabell and Zach’s results they weren’t even close. Dawson and I got 9.96m for the height of the flag pole and Annabell and Zach got 11.2m. How did we get 9.96m? We know the distance between me and the flag pole is 5.95m and the angle we got using the clinometer is 55 degrees. The measurement we need to know is the height of the flag pole. 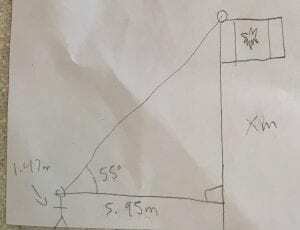 SO we used Tangent because the opposite length from the angle is the flag pole and the adjacent is the distance from the flag pole which is 5.95m. We did Tan55 x 5.95m = 8.49m. Then we needed to add the distance from my eyes to the ground so we get the true measurement. 8.49m + 9.96m. I think you meant you used the meter stick to find the height of your eyes? (group?) Nice attention to detail when using the clinometer! Why do you think your answer was different than Annabell’s and Zach’s, and what could account for the difference?